Nowadays video marketing is getting more popular then content marketing we can say that video marketing is the future of content marketing, so inserting videos in your blog posts is also very useful. As some people like to read written article (like me) while some people understand videos better then written articles that’s why embedding videos to your blog posts is very useful as your visitors will understand the things which you are saying easily. Whenever I create a video I share it with many sites so that I can get most out of my video and the interesting thing is when you share your videos with multiple sources you get better results, one thing which I and most of the Bloggers likes Harsh Agrawal do is they embed the videos related to their contents with their new blog posts. This produces a good impression on visitors as well as on search engines that you are informing the visitors with best information they are looking for. 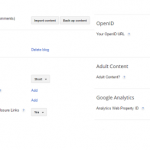 Benefits of inserting/adding videos in blog posts. Well, if you ask for the benefits of inserting/adding videos in your blog posts there are many benefits of doing so, some of them (most important) are described below. Deliver’s your messages easily: When you embed any video in your blog post which is related to your contents you deliver your message to your visitors easily and quickly and resultantly they start loving your blog. Your visitors are engaged: I have been noting this point for a long time, when you insert a video and some visitors start watching to your videos they spend more time on your site instead of just written contents this gives a good impression to search engines like Google, because Google also measures how much time a visitor spends on your site you can also find a rough information of how much time visitors spend on your site using Google Analytics. You get more traffic: Yes this is 100% sure point that you get more traffic by adding videos to your blog contents. You will be aware that Google wants to display the best results to the search queries so if you insert videos in your contents your blog posts are also ranked well. Solves the visitor’s problems easily: This is what which you should do if you want to get ranked on Google, you should be problem solver, if you can solve the problems of your visitors then you are working well and videos are the best source to solve the problems of your customers, as single video speaks thousands of words. Saves your time: If you are writing for technology site then you can save your much time by embedding videos instead of writing much lengthy contents, if you put just one video in your content then you can save your as well as your visitor’s time. Differentiate yourself from your competition using videos: Yes videos are the best source to differentiate you and your competitors and can help you much for standing you out of the crowd as people are trending towards videos then that of written articles. If you are interested to add your Facebook videos to your blog posts then it is very easy process. You just need to follow some steps gives below and that’s it your videos will be inserted into your blog posts. First login to your Facebook account. Make sure you have a Facebook page or a group, because you cannot embed those videos which you share on your profile. Now start playing the video which you want to embed. On the right top corner of the video click on the down arrow sign and select Embed video option. A popup will appear just copy the video code and login to your Blogger account. Click on the New post button and switch to the HTML Mode in Blogger’s post editor. Paste the HTML code in the HTML editor in your desired place and save the post. 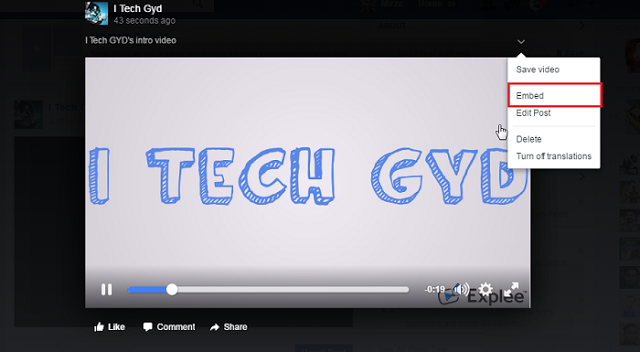 That’s it your Facebook video has been inserted in your blog post below is an example of this. For embedding your own YouTube videos you need to have your own channel on YouTube, because if you want to upload videos to YouTube then you have to create a channel. If you want to embed other’s videos in your blog post then skip below two lines. Simply login to your Gmail account, if you don’t have one then sign up for Gmail. Go to YouTube, there click on Upload button at the right top corner of the screen and YouTube will prompt you to create your first YouTube channel. 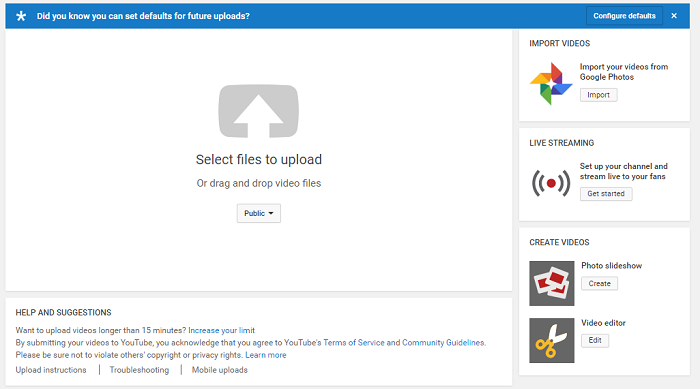 After creating your own YouTube channel upload your videos which you want to embed. When video is ready play it and in the sharing section switch to the second tab which is embed. There you can see the embed code which you can place on your blog, so copy that code and come back to your blog’s post editor and switch to the HTML mode and paste the code where you want to appear you video. That’s it you have successfully inserted/added YouTube video on your blog post. Dailymotion is just another popular video playing site, on Dailymotion you can upload your videos and can share them with the world, it is not as popular as YouTube but it is still a very good site for upload your videos. If you also want to embed Dailymotion videos to your site then it is also very simple, you need to follow the below steps. Go to dailymotion.com and click on the Upload button on the right top corner of the page. 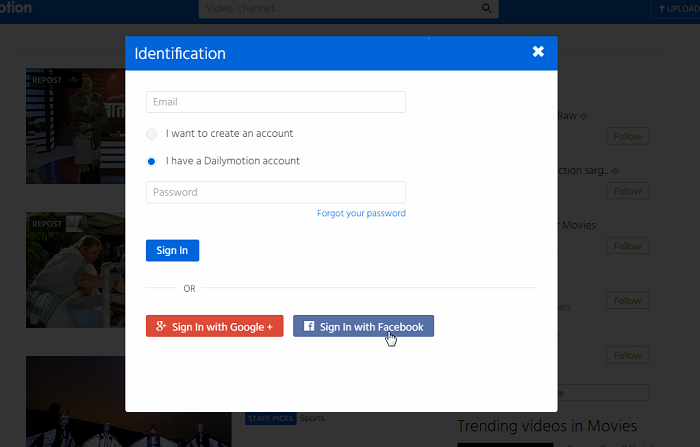 Dailymotion will prompt you to create an account just sign up for dailymotion either with your email or by using Facebook. When you have signed up just upload your videos which you want to embed. 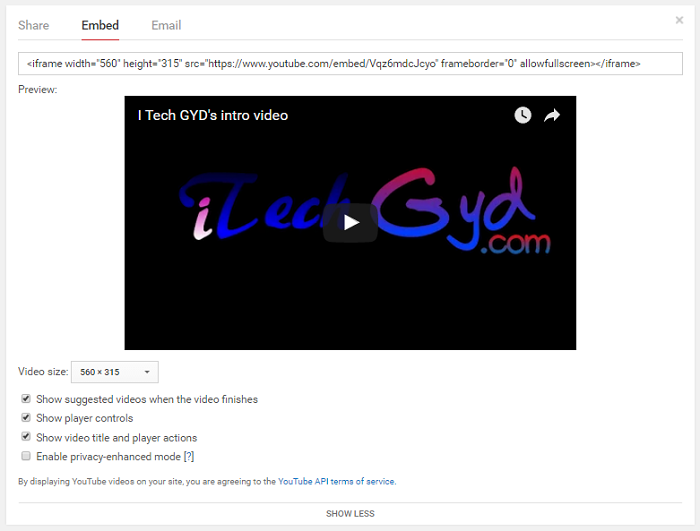 After uploading videos go to the video which you want to embed. Scroll down a little and switch to the share tab. 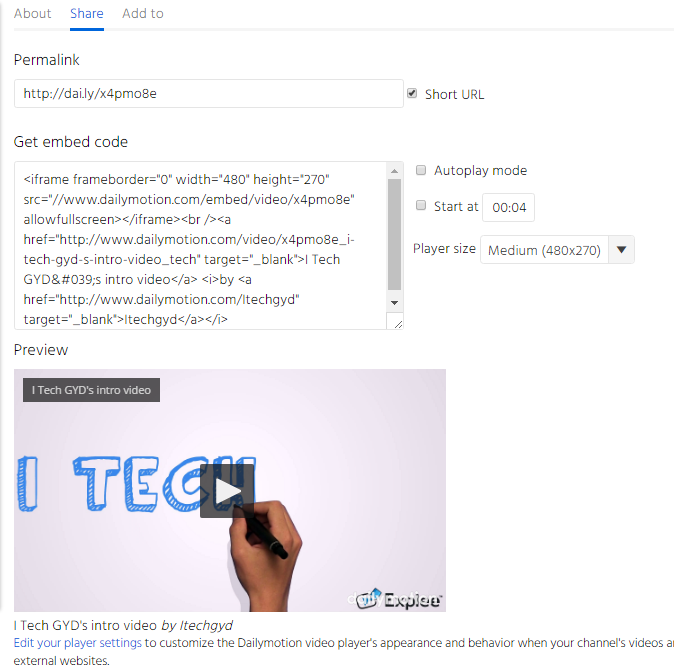 There you can copy the embed code of your video. Paste it into your webpages where you want. That’s it you have successfully embed Dailymotion video to your blog posts. Vimeo is just one more video playing site which has got its popularity recently due to its high performance and it is getting more and more popular so you should share your videos on Vimeo too. 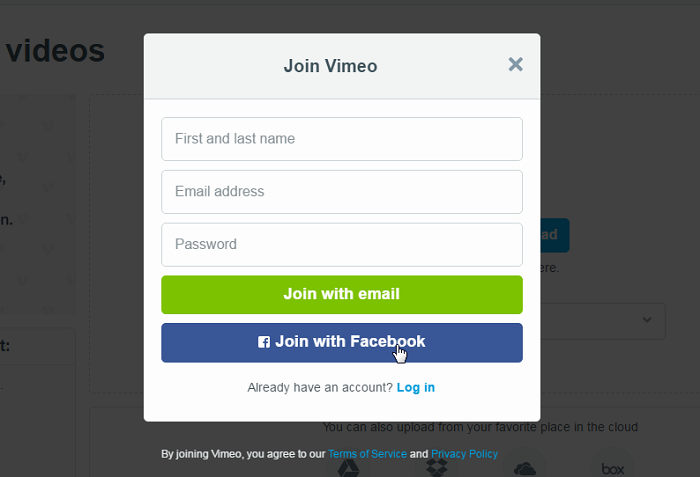 For embedding Vimeo videos to your blog post first you need a Vimeo account. 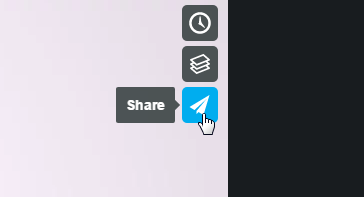 So go to vimeo.com and click on the Upload button at the right top corner of the page. Now you have to create an account on Vimeo so just signup using your email or Facebook. After signing up upload your videos to Vimeo’s servers and go to the video page. Click on the share button at the right side of video. Copy the embed code and paste on your site where you want to video appear and you are done. All of above was a simple and easy method for inserting YouTube, Dailymotion, Facebook and Vimeo videos on your blogger blogs. You know video is must and one of the Google ranking factors? If you don’t then you’ll know. Some people don’t know that embedding videos in a article is necessary. Everyone wants to watch videos because they get bored of reading article consistently. Many people leave from site without reading the whole post. If they see a video during the post, the chances are high that they will stick with the article for a long time. Video has most value in nowadays so you’ll try to add videos in your every blog post. The above method is so easy. You just need to embed the code on your blog and you’re done. That’s it. This process will take your 2 minutes and can make your post more beautiful and attractive. The chances will be high that your post will rank in Google and other search engines. So, everything is in front of you and now its up to you when you apply this method. I suggest you to don’t waste your much time and add videos on your every post quickly. I am sure your blog will rank instantly. So, this was our guide about how you can embed videos on your blog. I am sure you’ll love it and will definitely try yourself. You can share this post with all of your friends and help them to rank their blog by adding videos. If you have any questions, you can ask in the comment sections. So, good luck and don’t forget to share your experience after adding videos. I am sure this little aspect takes your blog to the next level and you’ll soon rank your blog by doing it. Give your feedback bellow it’ll be appreciable for us.